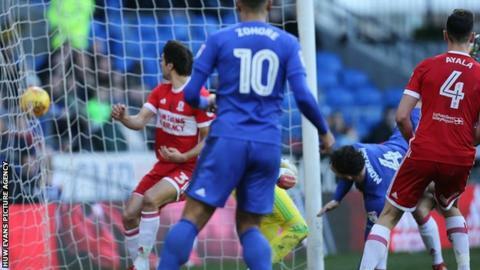 Cardiff City climbed up to second place in the Championship with a gritty win over Middlesbrough. On the day an earthquake struck south Wales, Cardiff City Stadium was an epicentre of inactivity until Sean Morrison headed the hosts in front. Chances remained rare, with the best falling to Junior Hoilett, whose shot was saved by keeper Darren Randolph. Cardiff are now two points clear of third-placed Aston Villa, who lost at Fulham. A sixth Championship match without defeat for the Bluebirds also means they are now 11 points clear of Preston in seventh outside the play-offs. Middlesbrough, meanwhile, remain ninth, four points adrift of the top six. A meeting between teams managed by Neil Warnock and Tony Pulis was always likely to produce a rugged, physical encounter, and so it proved. Neither side was able to keep possession or attack fluently in a disjointed first half, with efforts on goal largely limited to long-range strikes from Hoilett and Boro's Adama Traore. Predictably, it was a set-piece which led to the goal. Hoilett whipped in a deep, in-swinging free-kick towards the back post, where Morrison rose above Ben Gibson to glance in his second headed goal in a week. Cardiff had beaten Bolton here four days earlier with two goals from set-pieces and this was another functional, professional display. They had to withstand pressure late on as Boro launched a series of long balls into their penalty area, but Pulis' side were unable to fashion any genuine scoring opportunities against Cardiff's resolute defence. "As good as it gets really. They've got some good players in their team. We restricted them to very few [chances], I think one shot in the whole game. "We had to defend the long throws, like we knew we would, but I thought we did that ever so well. "We could have scored more goals but we never do anything simply. We had some good chances and, when you can't take your chances, you've got to defend well and make sure when the other team throw the ball in the box that you can defend." "I thought in the first half we found it difficult to cope with Cardiff. They're very good at what they do, they have an identity and they play to that identity. "Whether you like it or not, they do it very well. "Set plays were always going to be important. Looking back at it, we think it was a free-kick [for the goal]. Morrison was all over Gibson but we didn't get that decision and that was the decisive moment." Match ends, Cardiff City 1, Middlesbrough 0. Second Half ends, Cardiff City 1, Middlesbrough 0. Attempt saved. Joe Ralls (Cardiff City) left footed shot from outside the box is saved in the bottom right corner. Corner, Middlesbrough. Conceded by Joe Bennett. Attempt blocked. Stewart Downing (Middlesbrough) left footed shot from outside the box is blocked. Attempt blocked. Daniel Ayala (Middlesbrough) header from the right side of the six yard box is blocked. Assisted by Jack Harrison with a cross. Attempt missed. George Friend (Middlesbrough) header from the centre of the box misses to the right. Assisted by Stewart Downing with a cross following a set piece situation. George Friend (Middlesbrough) wins a free kick on the left wing. Foul by Loïc Damour (Cardiff City). Corner, Cardiff City. Conceded by Ryan Shotton. Attempt blocked. David Junior Hoilett (Cardiff City) right footed shot from the centre of the box is blocked. Assisted by Loïc Damour. Substitution, Cardiff City. Greg Halford replaces Callum Paterson. Substitution, Middlesbrough. Patrick Bamford replaces Rudy Gestede. Substitution, Middlesbrough. Jack Harrison replaces Jonny Howson. Foul by Rudy Gestede (Middlesbrough). Britt Assombalonga (Middlesbrough) wins a free kick in the defensive half. Adama Traoré (Middlesbrough) wins a free kick in the attacking half. Attempt saved. Loïc Damour (Cardiff City) right footed shot from outside the box is saved in the top left corner. Substitution, Cardiff City. Loïc Damour replaces Marko Grujic. Substitution, Cardiff City. Lee Peltier replaces Armand Traore. Attempt missed. Sean Morrison (Cardiff City) header from the centre of the box misses to the left. Assisted by Callum Paterson with a cross. Attempt saved. David Junior Hoilett (Cardiff City) right footed shot from the centre of the box is saved in the centre of the goal. Attempt missed. Kenneth Zohore (Cardiff City) header from the centre of the box misses to the left. Assisted by Marko Grujic with a cross. Foul by Adama Traoré (Middlesbrough). Substitution, Middlesbrough. Britt Assombalonga replaces Muhamed Besic.